As we as a nation face another anniversary of 9-11, I have an overwhelming feeling of sadness and worry. And unlike previous years, they go hand-in-hand for a different reason. I worry that we are forgetting and that makes me incredibly sad. Living in north Jersey and having seen the smoke rise from the pile, I remember every previous year there was a lot of coverage leading up to the anniversary. This year? I have hardly seen anything about planned events or how they will be covered on the news. I hate going to work on 9-11. I would much rather stay home and watch the coverage on television or go to a local memorial service. I am sure just like many others, I play that day’s events over and over in my mind. 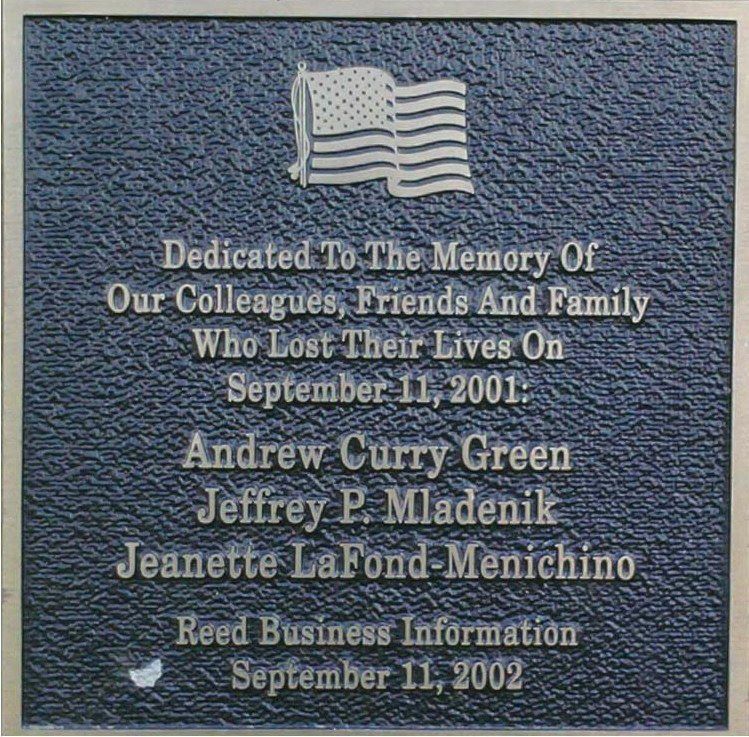 I first heard about it from a confused report on 104.3 as I was just reaching my office that there was some kind of “fire or accident at the World Trade Center.” By the time I parked the car, made it inside, and launched the Internet, I saw a still of the second plane just before it crashed into the South Tower. My head was full of confusion and stunned silence. The President of our division came over the PA system and said “it is obvious something is going on today, if anyone needs to leave, just go.” I immediately thought of two colleagues who were flying out of Newark that morning. We all scrambled to find their flight information and find out if they were safe. The Internet was painfully slow and we had no television access. I went up to the local Radio Shack to see if I could get some cables to rig up a local television channel. No luck. We drove up the hill from my office to see if we could see anything. I was stunned by the amount of smoke you could see all the way to Morris Plains, NJ. We went back to the office and I called my mother and she held the phone up to the television. I put my office phone on speaker and people crowded into my cube to listen. I suddenly thought of my best friend from high school. Her father worked at the WTC. Her mother was a teacher in my hometown. I could feel the blood drain from my face. I asked my mother if she heard anything yet and she said no. I grabbed my purse, ran up to the division president’s office. Gave him my colleague’s flight information, told him no one had heard from my friend’s father and that I was leaving for the day. I drove straight to the school where my friend’s mother worked. When I approached the school and rang the bell, I heard the familiar voice of the principal. I told him that it was me and who I was there to see. He buzzed me in and I ran to his office. I found my friend’s mother clutching a paper plate with a phone number scribbled across it. I knelt down next to her and asked how she was doing. She looked truly frightened. I will never forget the look on her face. She just said “this is where he is supposed to be today, but there’s no answer.” I asked her to come to my house and sit with my mother, but she didn’t want to leave. The principal also suggested she go with me, but she refused. I just went home and sat in stunned silence. I really didn’t know what to do. Well, thankfully for us, my two colleagues and my friend’s father were all safe. But that wasn’t the case for two employees from a different division and the sister of a colleague. They all perished at the WTC site. But I am also worried. I am worried as time passes, the dragon will once again return to slumber. I worry that the politics related to this horrific event are beginning to overshadow the event itself. And what truly disgusts me is that there are some trying to profit from it – like a golf course in Wisconsin. Does the “Day of Service” help us remember? I honestly don’t know. I understand the idea behind it, but I am not sure about the correlation between thousands of innocent civilians being murdered with cleaning up a local park. Maybe I am looking for something too deep or something that just isn’t there. I pray we never forget. I have a friend who is working with her small band of loyal New Jerseyans to identify and clean up small cemeteries where Revolutionary War Veterans are buried. Over the hundreds of years since their sacrifice, their final resting places have often become overgrown, forgotten, and lost to time. That is, until she found them and reminded everyone of their sacrifice. I hope the memory of that horrible day and those souls that were lost do not become forgotten like an overgrown cemetery. Tomorrow is the 11th anniversary of the day that changed America. Last year, on the 10th anniversary, the New York City memorial opened. It was an amazing structure and a beautiful way to remember so many on such a heart breaking day. Well, since then, many have equated the memorial to an amusement park. People have been seen leaving their Starbucks cups, letting their children throw stuff in the reflecting pool, and my personal favorite, seating toddlers on top of the plaques holding the names of the fallen. To me that is like someone standing on a headstone in a cemetery. While I am sure this poor behavior is a minority, I think it is important for visitors to remember this isn’t a tourist spot. It is where 3,000 lost their lives and to treat it with the proper respect it deserves. I think it is also important that during this year’s ceremonies politicians aren’t going to speak. I believe these events shouldn’t be politicized. No matter what a person’s political affiliation, this is an American event. Politics should stay out of it. When Usama Bin Laden was killed and the President, the New York and New Jersey Governors, and the New York City Mayor went to lay a wreath at the memorial, before the event began, and I am sure they didn’t know they were on camera, they were laughing and joking. The moment they realized they were on camera, they became serious. It left me feeling icky. Many worry – and I am one of them – that as time progresses and people move forward, people may forget. I hope that isn’t the case. The moment we start to forget, the dragon goes back to sleep and we are vulnerable. As we move closer to the 10th anniversary of one of the darkest days in American history, the organization American Atheists have filed a lawsuit to exclude what has become known as the “World Trade Center Cross” from the National September 11th Memorial and Museum, claiming separation of church and state. I had an opportunity to review the American Atheists’ website and they are what I call an “equal opportunity offender.” They have quite a high opinion of themselves and belittle those of any faith – Christian, Judaism, Muslims (or as they refer to Muslims as “Mohammedans”), Mormonism – the list goes on and on. Now, I don’t begrudge anyone who has a belief in anything – Jew, Pagan, Christian, or Muslim. As long as your belief is pure and not “warped” (a.k.a. terrorists), that is fine with me. But for these people to not only belittle someone else’s belief system, but claim separation of church and state on this issue is shameful and plain wrong. In the instance of the World Trade Center Cross, the government is not creating a law or prohibiting the exercise of religion. Therefore, their lawsuit is unfounded. Ultimately, the World Trade Center Cross is more than a cross; it is a symbol – an artifact from a horrible day that brought comfort to many who toiled on that pile of rubble for months on end to try and bring some closure to the families that lost a loved on that day we will never forget. It is that reason alone why it should be included. It is more about hope than a specific faith. So last night was the 2011 State of the Union Address. I will admit that my eye wasn’t twitching quite as much as last year, but I still have issues with a number of the items that were discussed. I think the President started out well by acknowledging the empty chair for Gabby Giffords. The ribbons everyone wore I thought was a nice touch. He also discussed a new level of civility in light of the shooting in Arizona. Call it the Jersey cynic in me, but the “date night” and new bipartisan effort just felt fake to me. I still get the feeling of a “hand slap” by the left and blaming the Tea Party movement, even though the nut job in Arizona didn’t appear to have a political affiliation. I find it funny that now the President wants to not think about winning an election, but doing what is necessary to pull the nation together. I liked what the President said about simplifying the tax code, but fell short of calling for a flat tax, which would ultimately save billions by either cutting or completely eliminating the IRS. I really believe that moving away from the current complicated tax code will both save money on the federal level while making sure everyone pays their fair share. He cited a quote from President Kennedy that “The future is not a gift. It is an achievement.” Well, I disagree with that sentiment. The future is a responsibility; first and foremost. I think we as a nation have really lost the concept of personal responsibility. Should we take care of those who need assistance? Yes. Should there be a level of personal responsibility associated along with that? Absolutely! I found his more business-friendly tone encouraging. Again, I hope it isn’t just rhetoric and real action will follow. This means getting the government out of the way of private industry and let them do what they do best; innovate and create jobs. Remember, it is not the job of the federal government to create jobs. It is the job of the federal government to create conditions that are favorable for private industry to create jobs. The President is still pushing green technologies, which is certainly laudable, however, I again wonder if this should be the business of the federal government. I point to California’s recent light bulb issue as the exact type of government intervention that while positive in concept can be negative in the long run. From an education standpoint, I was very encouraged to finally hear someone (and I mean anyone) acknowledge that parents need to take a more positive role in the education of our nation’s children. For far too long, schools have been trying to be both educator and parent. Ultimately, they will fail as both. I also ask that while math and science are incredibly important, that the arts and music are not left on the side of the road. There has been study after study citing the importance of music and the arts in fostering a child’s creativity and improving math, science and language skills. I am the adult I am because of my involvement in the music program in my public school system. It was also nice to hear there should be more respect for teachers. As someone who is married to a public school teacher, I say it is not as easy as many may think. We should be encouraging our teachers, not putting them down. Otherwise, no young individual will want to become a teacher. And that will be truly sad and detrimental to our future. I almost fell off the couch when the President actually used the term “illegal immigrant” and not “undocumented” or other term. Whether the individual is a child or an adult, they are here illegally and thus breaking the law. They shouldn’t be here sucking up resources like locusts they have no right to access. And these aren’t all the wonderful young individuals looking to better themselves the President mentioned. They are often gang members trying to sneak people and drugs into our country. This is the single issue that will kill us as a nation if it is not dealt with, and I mean NOW. I also agree the federal government should reorganize and streamline, however, again, call me a cynic, I really don’t see this happening. I hope I am wrong. I found it interesting that the President is open to make some of the very healthcare bill changes the GOP suggested originally and he wouldn’t he even consider. Amazing what a shellacking can do for bipartisanship. And by the way, I hadn’t heard that word since I was a kid and my Uncle Sonny would threaten us with a shellacking that would never appear. If anything, he was the one to protect us all from the shellacking. Of course, no State of the Union would be complete without a discussion of our military. Again, I refer back to my previous thoughts about illegal immigration. These two issues go hand-in-hand in my opinion. Illegal immigration is a serious national security issue. So, as usual, I am hopeful, but not betting the house on it. The only reason the President has moved to the middle, I believe, is because he got beat and I mean seriously beat. I would like to see him not spend on infrastructure and instead let private industry develop tomorrow’s high speed railways. Again, just allow for private industry to do what they do best and get out of their way. Yesterday I was listening to Mark Steyn who was subbing for Rush Limbaugh and I feel I need to verbalize my objection to some comments he made yesterday regarding the 9-11 health care bill passed during the lame duck session of Congress. Mr. Steyn is claiming that because these 9-11 first responders, emergency personnel and construction workers who are part of this coverage shouldn’t get more money from the government. Why you ask? Well, according to Mr. Steyn, since they are more than likely part of a union, they already have a great union-negotiated health plan, so we as tax payers shouldn’t have to give them more money. I’m sorry Mr. Steyn, but you couldn’t be more wrong. This really burned me. First of all, I believe these heroes should be taken care of like our soldiers and get whatever is needed to care for their health issues that are a result of working on the pile, looking for survivors, recovering those who were killed and clearing debris. They were there on Thanksgiving. They were there on Christmas. They took this job seriously and were both determined and respectful of their duties. I am guessing you, Mr. Steyn, have never lost someone due to catastrophic illness. It can financially and emotionally devastate a family, often ending in the loss of homes or the need to declare bankruptcy. There are often lifetime limits that are paid and benefits can quickly run out when individuals so young are struck with illnesses like lung cancer, mesothelioma, thyroid cancer and other horrible illnesses that often end in death. As I said earlier, I’m sorry Mr. Steyn, but you are wrong.